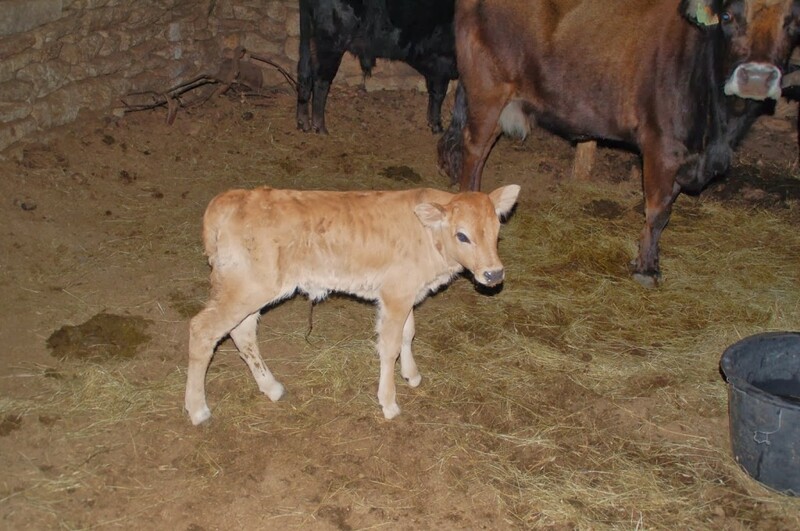 At the end of January, a female Maronesa cow was born in the Faia Brava Reserve, one of the Rewilding Europe core areas in Western Iberia. Totally, there are now 10 Maronesa individuals living in a semi-wild way at Faia Brava. The Maronesa herd is initiated and developed at Faia Brava together with the Tauros Programme, in which Rewilding Europe and the Taurus Foundation are partners, with the aim to backbreed primitive cattle breeds like the Maronesa to something that as closely as possible resembles the aurochs. The aurochs was the ancestor of all domestic cattle in the world and it was a keystone-species in many European ecosystems for hundreds of thousands of years, and so also here in Faia Brava of course, something for which the proof is pretty solid – many hundreds of ancient rock carvings showing the aurochs can be seen in the Côa valley. The Maronesa is one of the six breeds that has been defined through DNA studies as being pretty near the extinct aurochs, genetically. It also looks much like the aurochs did. The objective is to cross it now with the ancient and aurochs-looking Sayaguesa cattle breed, from the herd that exists in the Campanários de Azaba Reserve, which is the second rewilding core area in Western Iberia. The Sayaguesa and Maronesa cows have also been released into these areas in Western Iberia f or another reason: to bring back the natural grazing regime in the two reserves , which they now carry out very well, together with herds of the ancient horse breeds called Retuertas and Garranos. The final goal of the Tauros Programme, to be met maybe in some 20 years, is the presence of the Tauros as a self-sufficient wild bovine grazer, in herds of at least 150 animals in several rewilding areas in Europe. In November 2012, Rewilding Europe and the Taurus Foundation signed a long-term agreement about helping to preserve biodiversity in Europe through a breeding programme to bring back a functional, wild version of the aurochs. Around 2025, the Tauros are expected to again have the right, fully natural characteristics of the aurochs. By then the animal is also expected to have gained official recognition as a wildlife species and released back into the wild in a number of areas, starting off mainly within the Rewilding Europe initiative. The first breeding results already look very promising, so most likely already within just a couple of years there will be herds that will begin to look and function very much like original aurochs-herds once did. Western Iberia serves as one the first pilots in Europe for the bigger programme and the growth of the Maronesa herd is very inspiring and promising news that the rewilding process is sucessfully moving ahead.